Location was a plus for this one-bedroom-plus-den suite in a highrise overlooking Serena Gundy Park – which connects to Sunnybrook Park and Edwards Gardens – and helped the unit sell relatively quickly, though slightly under asking. In the Carrington on the Park residence, which is one of three buildings built on the former Inn on the Park site, this 770-square-foot model has a bright, open feel with nine-foot ceilings and south-east facing windows. Finishes remain current with stainless steel appliances, granite counters and tile floors in the U-shaped kitchen, as well as laminate floors and sliding balcony doors in the combined living and dining area. For privacy, there is a den behind French doors and a bedroom with a semi-ensuite bathroom around the corner. The unit is also packaged with laundry machines, double storage locker and parking. Monthly fees of $503 towards utilities, 24-hour concierge and common gym, pool and rooftop garden. "It's a pretty popular building and quite luxurious for downsizers moving from large homes in the area," agent Julie Kinnear said. "It's near greenspace, the highways and Leaside." There were also advantages to this particular suite. "It was the preferred layout with an extra office," Ms. Kinnear said. 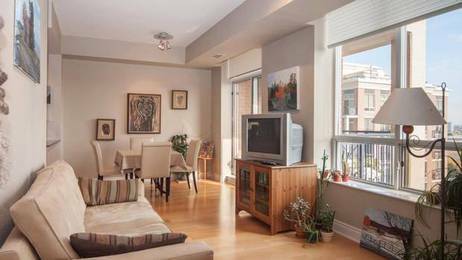 "It has very nice views of the Don Valley, especially in the fall with the colour changes."